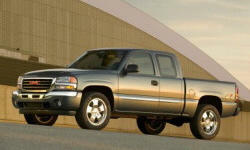 GMC Sierra 1500 Pros and Cons | Page 1 of 1 | Why Not This Car? What drives people to buy (or not buy) a certain car? 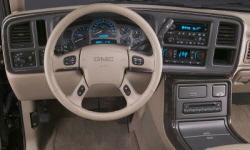 TrueDelta's members share GMC Sierra 1500 pros and cons based on their real-world driving experiences. This has to be one of the quietest vehicles I have ever owned and that is comparing it to a Mercedes ML 63 and a Range Rover Sport ATB. The active noise cancellation really works and I can have conversations with the people in the back at normal voice volume. The only full size pick up with an AWD system that I could find. The best option for the variable weather conditions we have here in the PNW. It was cheaper than Ford, Toyota, AND Dodge as a used vehicle. Flows nicely, classy front end. It is more refined and "truck" looking than the Silverado. It looks "how a truck is supposed to look". More comfortable than the others in 04. Can drive comfortably for several hours. Visibility was good, Nissan was the worst.